Then again, Truex wasn’t inclined to let anyone get close in earning his first Kentucky triumph. Truex’s dominance stole the spotlight from Kyle Busch, who won the Xfinity Series race earlier Saturday and for a while appeared headed toward NASCAR’s first same-day sweep of the two series. 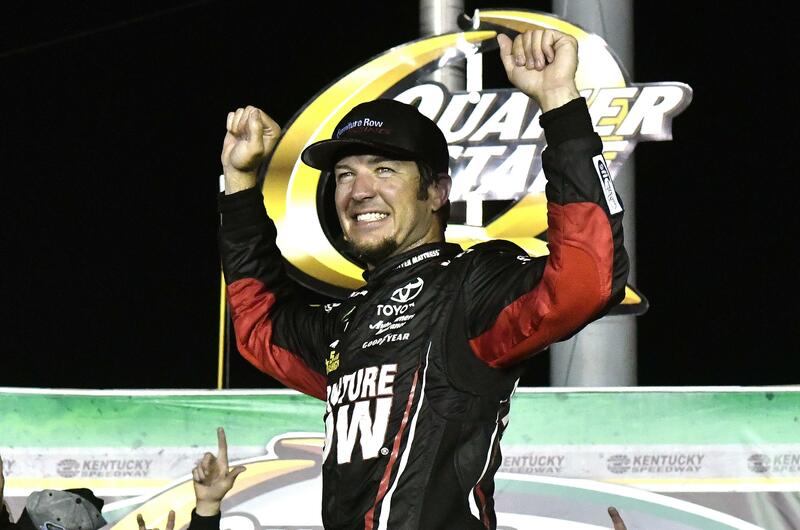 But Kentucky’s most dominant driver – nor anybody – else could touch Truex. Larson’s finish was impressive considering he started 40th after failing inspection on Friday. He soon was among the contenders before being penalized for speeding on pit road, overcoming that setback to pass Kyle Busch after the final restart. Will Power won the pole for Sunday’s IndyCar race at Iowa Speedway in Newton, Iowa. This is his fourth pole of the season. Power was fastest in Saturday’s single-car, two-lap runs on the oval. J.R. Hildebrand qualified second, followed by Helio Castroneves, Ed Carpenter and Indianapolis 500 winner Takuma Sato. Series leader Scott Dixon will start 17th after a disappointing qualifying run on the oval of just under nine-tenths of a mile. Power has already won twice this season. He will try to give Team Penske its first win in Iowa in 11 tries. Mercedes driver Valtteri Bottas beat Ferrari’s Sebastian Vettel to take pole position for the Austrian Grand Prix in Spielberg, Austria. It was the second pole of the Finnish driver’s career, and both have been since joining Mercedes this season. This pole was on the Spielberg track where Bottas secured his first podium finish three years ago, coming third when driving for Williams. Lewis Hamilton, who is second in the championship behind Vettel, qualified in third place but will start from eighth because of a grid penalty. That means Ferrari’s Kimi Raikkonen moves up from fourth to third. Published: July 8, 2017, 10:15 p.m.